Are you looking to sell salvaged or surplus semi trailers? 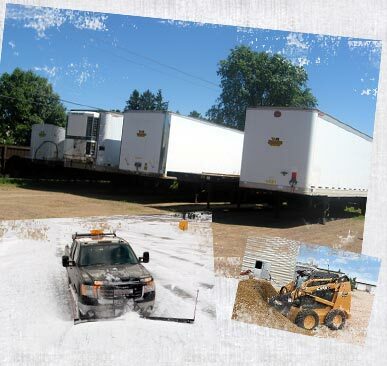 We are always on the look out for a great deal on used semi trailers and equipment. Call 715-720-9311 today! Do you need secure, on-site temporary storage? Are you looking for someone to transport heavy machinery? We offer a variety of services from on-site van storage rental and semi trailer purchasing to snow plowing and skid steer work. Call 715.720.9311 for a quote today. Rent a semi-trailer for a fraction of the cost of warehouse space and gain the convenience of having your product or materials on-site. Contact us to learn more about renting a semi trailer for on-site storage. Transport your heavy equipment and machinery with our trucking service. No matter whether you have a single piece of equipment or are a manufacturer or dealer with multiple shipments per day, we are ready to assist you with the level of service you demand. Our expert machinery movers, heavy equipment haulers, and riggers can complete your job quickly and safely. Protect your business and your customers with clear sidewalks and parking lots. We provide snow plowing services for businesses in Chippewa Falls and the greater Eau Claire area. Contact us today for more information. Do you have a project that requires a skid steer? We offer excellent service at a very reasonable hourly rate. Contact us today for more information. Please include any additional comments or questions you would like answered.